Marvel is pleased to announce that Thor #1 Second Printing Coipel Variant has sold out at Diamond (though copies may be available at the retail level)…and the issue will return for a third printing! 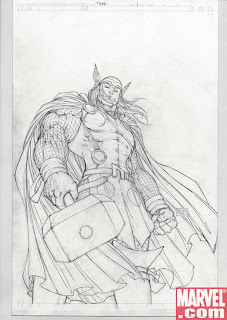 Featuring a black & white sketch version of superstar Michael Turner’s red hot Thor #1 cover (also available as a full color poster), Thor #1 Third Printing Turner Sketch Variant will arrive in stores to meet the overwhelming demand for the God Of Thunder’s return! Superstar writer JMS and red hot artist Olivier Coipel continue their thrilling rejuvenation of Thor in Thor #3, as the titular hero confronts his former ally Iron Man. How will the two deal with the effects of Civil War? Let’s just say that’s neither one is getting out of there without a few scratches! And if you missed the second issue of this series, make sure to pick up Thor #2 Coipel Wraparound Second Printing Variant, revealing just how Asgard returns! And for a special behind the scenes look at Thor, you can’t miss Marvel Spotlight: Thor!